This is a post was first published at: epLdc.blogspot.co.uk (edit 28 April 16, this website has now been archived, sorry about that - still exists, but as a private URL). This is short post based on some public observations on Twitter followers for 113 Essex Police UK Officers on twitter. Recording good audio seems to be incredibly overlooked in this age of gadgets. I have over ten microphones available to me, yet none as good as the Zoom H1. 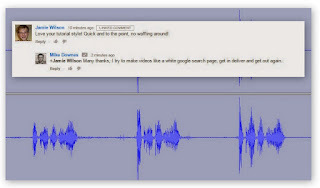 All I wanted to demonstrate to myself - How to record an everyday task in clear audio and without that much fuss. Kerry Blakeman has been engaging with the public he serves using live video broadcasts for five years. In this latest example, Superintendent Kerry is using the new facebook live to deliver a set of ten broadcasts over the course of one evening (4.30 to 10pm, Wed 9 March 2016). You can find all ten broadcasts at: facebook/wmp/videos or embedded in this post below. 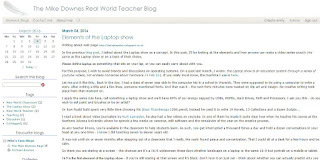 In the previous blog post, I talked about the Laptop show as a concept. In this post, I'll be looking at the elements and how anyone can make a video series exactly the same as the Laptop show or on a topic of their choice. Please define laptop as something that sits on your lap, or you can easily carry about with you. This post post was first made at my new Univeristy of Warwick Blog at: blogs.warwick.ac.uk/mikedownes (link to post is the laptop show). 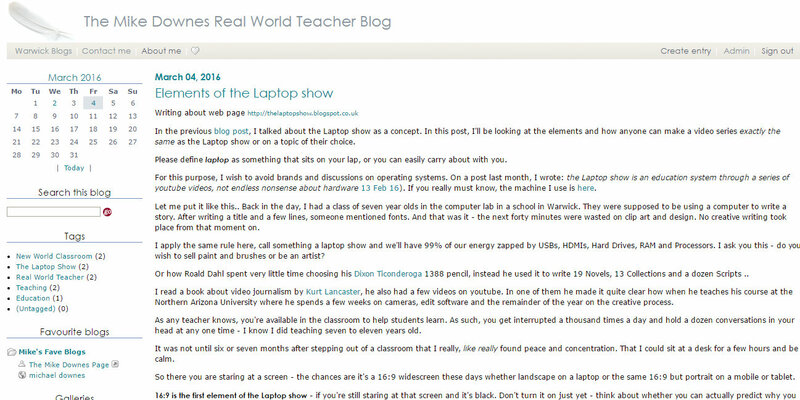 This blog replaces my former and much lesser Warwick Blog 2009 to 2011 (michaeldownes).